Wing span: 1 - 1 1/2 inches (2.5 - 3.9 cm). Identification: Upperside is dark brown. Male forewing has a cream spot at the end of the cell, and a divided stigma (the "broken dash"); female forewing has a few elongated cream spots. 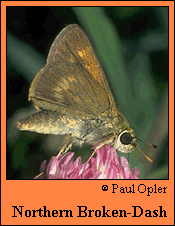 Underside is dark brown or purple-brown; hindwing has a pale band of spots. Life history: Adults have a slow flight. Males perch up to 6 feet above ground to wait for females, usually in the early morning. Caterpillars eat leaves; half-grown caterpillars hibernate. Flight: One brood from June-August; two broods from May-October in the Deep South and east Texas. Caterpillar hosts: Panic grasses including deertongue grass (Panicum clandestinum) and P. dichotomum. Adult food: Nectar from white, pink, or purple flowers is favored including dogbane, red clover, New Jersey tea, and sweet pepperbush. Many other flowers are visited. Habitat: Open places near woods or scrub. Range: Southern Maine and southern Ontario west across the Great Lakes states to southeastern North Dakota; south to central Florida, the Gulf Coast, and southeast Texas.